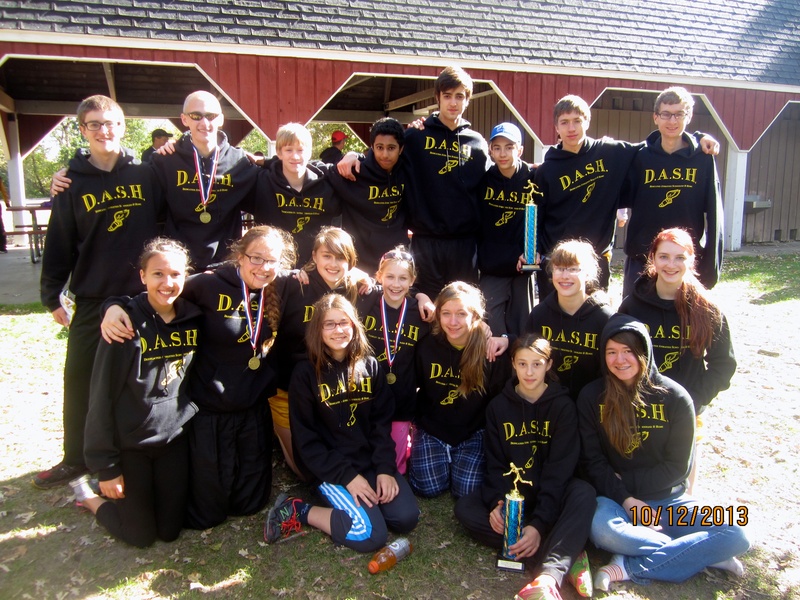 The DASH team ran in its second big homeschool championship meet this past Saturday. The setting this year was Lake Farm County Park in Madison. We would have a new course to learn which is always a challenge, along with an unaccustomed noon start to throw off our usual race-day routine. We would have to overcome those issues plus a cold, blustery day to have a chance to take home some homeschool championship trophies. The races would give us the answers to whether we were ready. The high school boys run first at this meet. With the Liberty Eagles unable to field a complete team, I figured our main rivals would be the Tri-State Flying Flamingoes and the Green Bay NEWCHAA teams. Once the gun went off and the race hit its first mile, a Flying Flamingo athlete was in the lead. Ransom Nyhart was running in 3rd, with Jacob Dickman not far behind. John Sherman, Joe Hughes, and Sam Zinkgraf passed by soon after. Zebulon Caspers was running well, ahead of a not so healthy Matt Lange, followed by Isaac Fredricks and Brady Klaves. After the first mile, It was evident that it was to be a two team race between the Flying flamingoes and the DASH team, with John, Joe, and Samuel holding the keys to our success. At the two mile mark, Ransom and Jacob were staying in the top-5 getting their job done. Two Flying Flamingo boys went through before we saw John Sherman. Within sight of John, Joe Hughes was running stride for stride with the next Flamingo. As Joe went past, he was told of the team’s urgency to have him get ahead. Samuel, always in sight of Joe, was staying ahead of the Flaming’s last scorer which was another situation that had to hold. As the boys came in sight of the finish, Jacob Dickman had gotten ahead of Ransom Nyhart as our stars finished 3rd and 4th overall. More important, they gave us a 1-2 punch of a mere five points as the 2nd place finisher was not on a full team. Two Flying Flamingo athletes came next, keeping the heat on us to hold our last spots. DASH yellow was soon spotted coming out of the woods and it was John Sherman. John had done his part. As we looked back, Joe Hughes was seen with a pink Flamingo jersey running a few strides back. Joe had come through. Now all eyes were on Sam. Samuel Zinkgraf came in sight right on schedule with the last Flamingo nowhere in sight. It looked like it would be a close victory for the DASH team. Later we would find out just how close. Matt Lange edged Zebulon Caspers at the finish. It was the first time Matt was not in our top-5. Fortunately our depth came though and we could withstand the inevitable sick days that happen. Zebulon set a personal record to end his season on a good note. Isaac Fredricks ran much better this time as did Brady Klaves. It was good to see them finish well. The high school girls received bad news a short while before the race when it was found out that Hannah Schein would not be able to make it. The girls did their best to make up for the loss with some great running. Andrea Beck, just like last week, moved into 2nd place, well ahead of 3rd, by the mile mark. It would be a two girl race once again. Andrea kept it close, and kept fighting to the end, completing the course in 16:27 to earn the 2nd place trophy. Zipporah Caspers strided through the course in 18:33, cutting over a minute off of her personal record. The course was fast, and we were taking advantage of it, posting some great times. Not to be outdone, Amelie Kemmann also cut off over a minute from her best time, and really showed off her amazing speed at the finish. Stefanie Klaves kept us in the chase for a trophy with her effort. Stefanie has come through for us all year, and this was no exception. Now we needed a great race from either Makayla Gergeni, Kristin Ulfeng, or Renee Walters. Unfortunately, Makayla was still running with her hip injury and could only give us so much. Kristin and Renee both had their best times of the year, but it was not enough, as we finished 7 points out of second. It was a valiant effort from the short-handed girls team. Our middle school boys team is very young this year, but it has been running very well of late. Joshua Anumolu’s goal was to be top-10 and he achieved his goal. Joshua never slowed on the long course and it is so exciting to see him compete at that level. John LaBonte ran a solid race, but ended up just out of the medals. Leif Kostrzewa kept up a relentless pace, and passed John Klaves late to be our third runner in. John Klaves was right behind Leif, and a little ahead of Daniel Caspers who also ran very hard to the end. Joshua LeSac struggled early, but came back to finish strong. Ed Sherman was back after missing a month with a neck injury and ran well. He will be needed next year. Seka Kostrzewa was the youngest competing athlete in a race where some teams only bring their older runners. He kept up as usual. Ethan Scholz is another athlete we have not seen enough of this year. He ran well in such a big race. Noah LaBonte and Elijah Anumolu were both coming off good races, but really struggled this time. Overall, the team scored as good as I had hoped. Next year, I expect us to be back in the race for a trophy. The DASH middle school girls would need to be very good if they were to win as they faced off against the defending champion Homeschool Eagles. Faith Caspers tried a little too hard to get us off to a good start. She was leading at the mile mark, but had clearly gone out too fast. It was a struggle the rest of the way for Faith, but she hung on for 4th. Rebecca Dickman gave us another top-10 finish as she ran very well and under control throughout. Sammie Ronge had not raced for two weeks and came in a little sick. She started way off her usual pace, but was able to move up late to finish 11th. At this point we were clearly running in 2nd place in the team scores. Our next runner in was surprisingly Simran Khunger. Simran has only been able to run sparingly this season, but she really picked up the team with her effort. Her strategy was a good one: try to keep up with Julianna Caspers. Julianna finished right behind SImran with another great race. She came in with a hole in her pants and a bloody knee after an early fall on the gravel road. She is a racer. Kayla Walters, Grace Dupar, and Lucretia Nyhart all gave us solid races and gave us eight athletes in the top-25. Our depth earned us the 2nd place trophy. Grace Zinkgraf looked good as she donned the DASH yellow once again. Let’s hope we see more of her in the near future. She can be very good. Angela Walters led Mary LeSac, Grace Caspers, and Maddy Schneider to the finish, each running in her first championship race. It will not be their last. We did some great DASH cheering as our individual award winners were called up. Sammie Ronge, Rebecca Dickman! and Faith Caspers accepted their awards for the middle school girls, and Joshua Anumolu for the middle school boys. Zipporah Caspers and Andrea Beck were called up for their high school awards, followed by Ransom Nyhart and Jacob Dickman. The middle school girls team went up to DASH cheering to accept their 2nd place trophy. 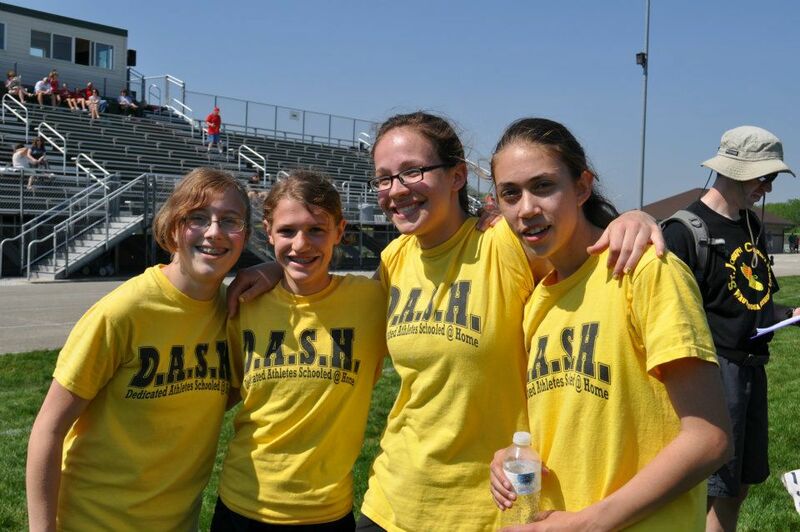 A groan was heard among the DASH fans when the scores for the high school girls race were announced. If we had had our full team, the 2nd place trophy would have been ours. The closest race of the day was declared to be the high school boys race, making us a little nervous. The DASH team was announced the winner by just three points. Our boys had done it again! Our top-5 boys all had personal records, with John Sherman and Joe Hughes breaking 20 minutes, and Samuel Zinkgraf just two seconds away. That is championship racing when you need it! That’s the kind of racing that gets talked about for years. Thanks to all the parents who made the drive to Madison. It was so nice to get almost the whole team to the race. Thanks to Carolyn Skalsky for hosting the meet. We know how much work that entails having done it at Greenfield Park the last two years. Thanks to Jilleen Pfarr for her meet director duties. 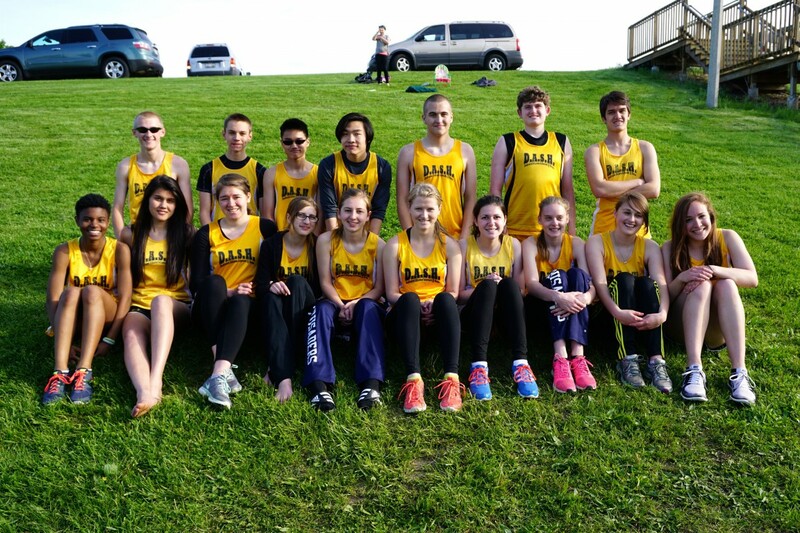 Thanks to the athletes for another exciting season. Thanks to Mary Beck and Beverly Ulfeng for volunteering for course marshal duties. Thanks to my wife, the camera lady, as well as Andrea Beck and Zipporah Caspers for taking the great photos. Thanks to Ed Beck for assisting me and the team in whatever is needed. Another season is over. It is time to put the blog to rest, have some ice cream, give the kids more homework, and get ready for track. We will make more great DASH memories then. I hope to see you there. 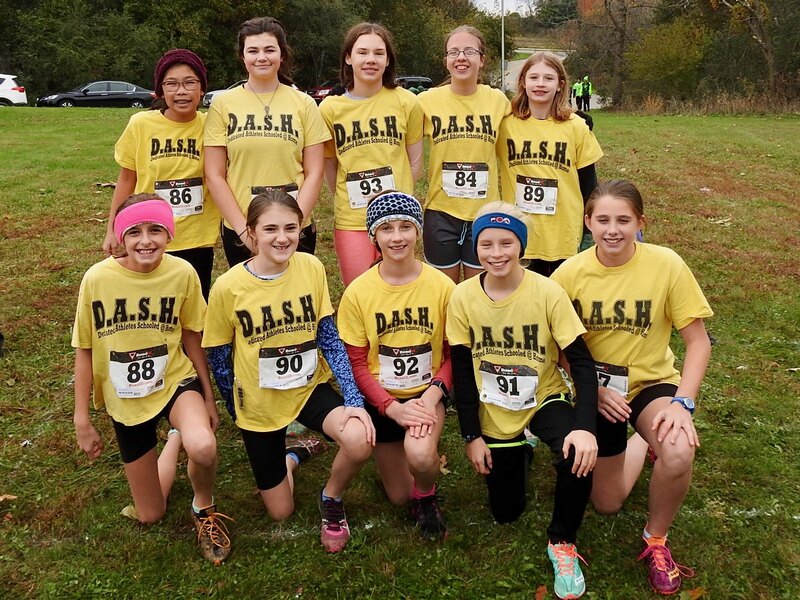 The time for Championship racing finally arrived for the DASH cross country team. The DASH caravan departed for Rochester, MN, Friday morning to participate in the Midwest Homeschool Championship. Coach Caspers, Mrs. Couppee, and Mrs. Kemmann drove 23 DASH fans in the DASH caravan, arriving promptly at Essex Park at 3:00 PM to scout the course. After getting lead scout Joe Hughes out of the trees, we were off to Perkins and then the Comfort Inn for the night. The athletes and Mr. Beck, strictly watched by the coach and other chaperones at all times, were allowed to attack each other in the pool only until 8:00 PM. Then it was time for pizza and chess matches until meeting the very strict curfew of 9:30 PM. The boys and girls middle schoolers lined up first. Joshua Anumolu and John LaBonte got out fast for the DASH team on the hilly course. Joshua ran with the leaders for awhile, but the very strong field wore him down some. 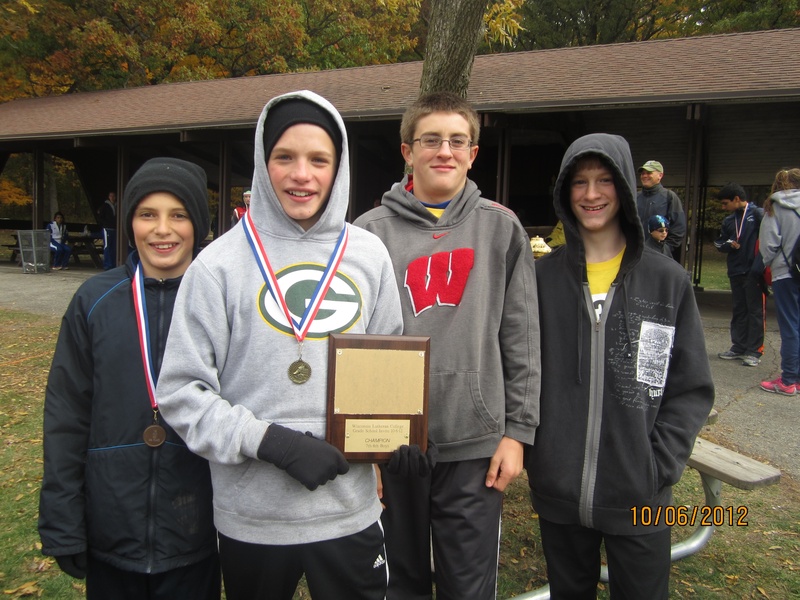 Joshua finished in 10th place overall, and the results showed him to be the first 7th grader to the finish. He will get another shot next year. John LaBonte did not fare as well on the hills as he did at the start. John coasted in and was passed by Faith Caspers before he kicked it in and edged her by a half step. 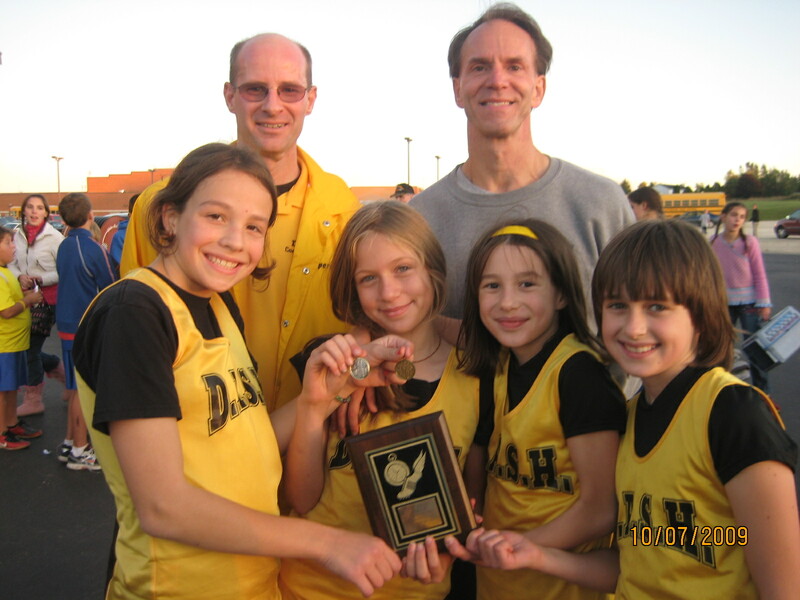 Faith Caspers led the girls from the start. She was challenged just before the big downhill that leads back to the finish, but then Faith took off and kept John in her sights the rest of the way. Faith set a course record, and finished 14 seconds ahead of second. The strict discipline was paying off. Rebecca Dickman has such a beautiful, easy stride that the pictures do not do justice to how fast she was going. Rebecca settled into 4th place early and was never threatened. It will be great having her back again next week. Lucretia Nyhart and Kayla Walters stuck together the whole way, running not far behind Rebecca. In the end, Lucretia burst ahead and moved up all the way to 6th place, just missing 5th by a step. She was disappointed that she would not be on the medal stand, but her effort sure got the coach excited. Kayla Walters can always be counted on to give us a great race, and this was no exception. She fought for an 8th place finish this time. I would love to see her back next year. Unfortunately, the girls did not have a 5th runner to put us in the running for the team awards. We would have won. Andrea Beck knew she would be running in the front, and was very nervous at the start of the girls high school race. She stayed with a breakout pack of four girls early, running in third. Going through the maze, Andrea took the lead for awhile, but settled into running in 2nd place, well ahead of third to the finish. It was a great medal winning effort from one of our long-time stars. Hannah Schein had the break-through race we have been waiting for. She cruised up and down the hilly course and seemed to get stronger every time she passed through. She has as much talent as anyone on the team. Let’s hope we see her again this year. Zipporah Caspers kept Hannah in her sights the whole way, giving us a very solid race once again. Zipporah is putting up very consistent races right now which is what we need from her. Amelie Kemmann, clearly ready to race with the cowbell out, set out on a fast pace and never faltered. Each time Zipporah passed, the wait for Amelie was right on schedule. This is where we dreamed Amelie would be at this point in the season. Our dreams were starting to come true. Kristin Ulfeng gave us the race we were hoping for as well. She kept plenty of girls behind her by staying focused and steady. Renee Walters, coming off an injury, is not in race shape yet. Nonetheless, she never gave up and made it to the finish on a long, very tough course. It was a great day for the girls with everyone running well. 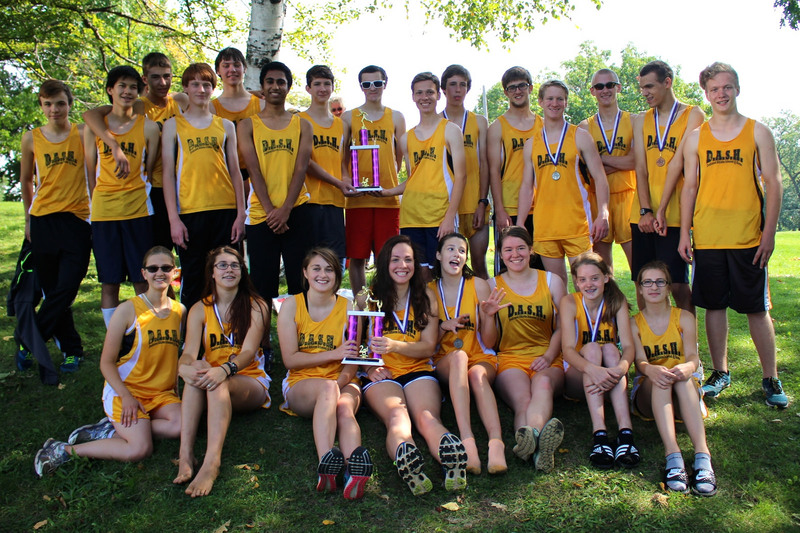 The boys race had three teams in contention. The Jaguars, the host team from Rochester; the defending Homeschool champion Liberty Eagles from Eau Claire; and our own DASH Team. There was a lot of talking at the start, with each team liking their chances. When the racing began, Ransom Nyhart got out fast, looking to control the race from the front. After the first loop, past the mile mark, Ransom and Jacob Dickman were running 1-3, with two Liberty Eagles in the lead pack with them. I thought it may be a two team race, but that was before five Jaguars passed through in succession. We had an epic race brewing! The rest of our boys team came through next, all running together. It would be up to Joe Hughes, Matt Lange, Samuel Zinkgraf, and Zebulon Caspers to move up if we were going to win. As the race entered the final loop, the lead pack was unchanged, with Ransom and Jacob in the lead pushing the pace hard. It was not long before Joe, Matt, and Sam came in view, and they had gotten ahead of two of the Jaguars. The lead was now ours with a little more than a mile left. The clock was watched nervously as we awaited the boys to come back out of the woods. The lead bike was heard, and a few seconds later Ransom Nyhart raced by. No one would catch him now. Heads were turned back to the woods, and the next to appear was our own Jacob Dickman, with a Liberty boy a few steps back. The Liberty athlete fought hard to catch Jacob. Just as he was about to draw even, Jacob took off on him and streaked to a second place finish. It was 1-2 for the DASH team! A roar was soon heard as Sam, Joe, and Matt were seen racing out of the woods. The overall team race was settled in our favor, but Sam still had something to prove. Sam roared ahead of Joe and Matt at the finish to be our third boy in, with Joe and Matt right behind. What a race for all of these guys! We needed great races from all of them, and we got nothing less. 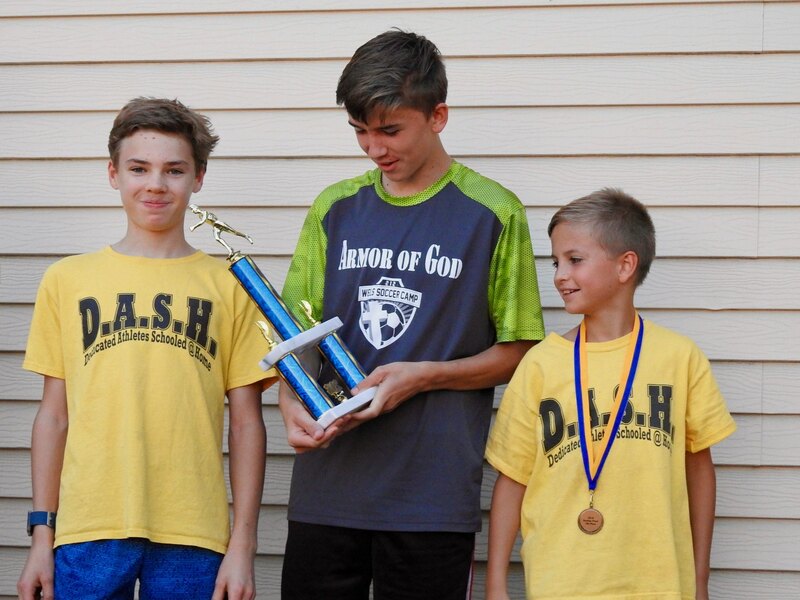 It was championship racing, and we ran like champions, Midwest Homeschool Champions! They served ice cream sandwiches before the awards. That was a week early for ice cream. For the first time, our discipline had lapsed. 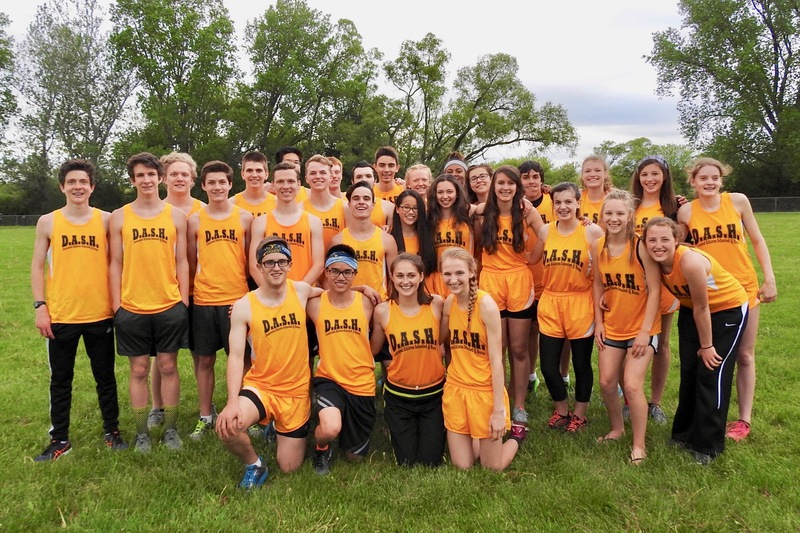 We gathered ourselves together again, and did some great DASH cheering as Rebecca Dickman, Faith Caspers, Andrea Beck, Jacob Dickman, Ransom Nyhart, and the whole high school boys team were called up to gather their awards. All 33 DASH fans were needed for all this championship cheering. I then wanted to get things moving so we could leave on time, but our discipline proved shaky again. We stayed late to enjoy the moment, and take plenty more great team photos. We eventually got things packed away and headed home, at least after a stop for gas and more celebrating at Wendy’s. Thanks are required to many for helping with a trip of this magnitude. 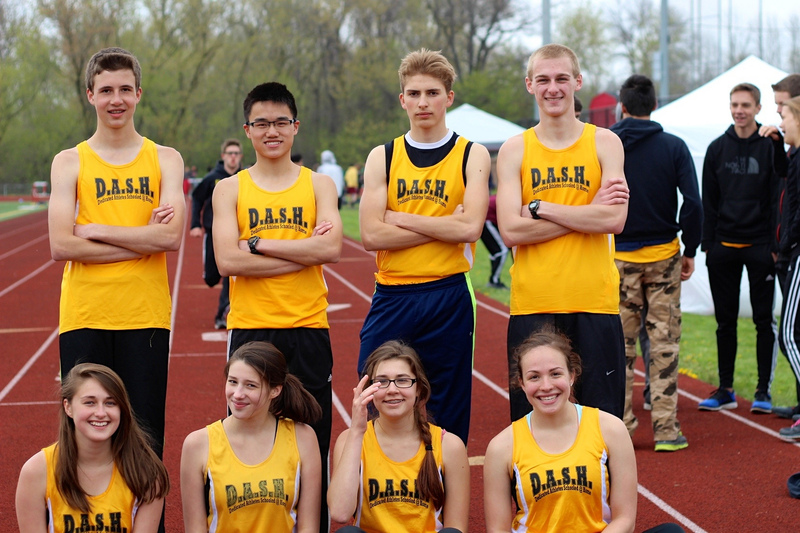 Thanks go out to Wayne Dickie and the Rochester homeschoolers who gave us the chance to race. Thanks to Birgit Kemmann and Kenli Couppee for keeping up with me on the highway. 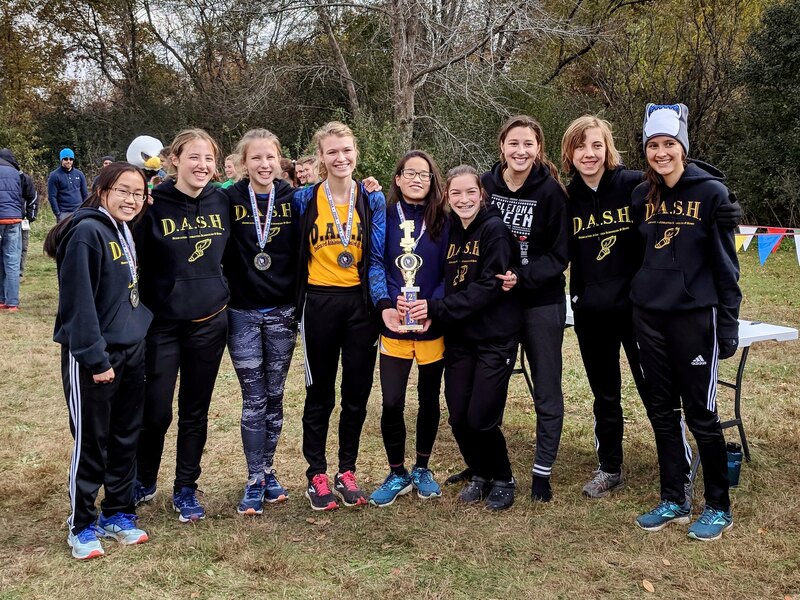 Thanks to Pete Dickman for providing us with such well-liked DASH sweatshirts which are displayed so prominently in the photos. Thanks to the camera lady for taking most of the photos. Thanks to our chaperones who helped keep the athletes disciplined and meeting curfew. Thanks to Beverly Ulfeng for helping watch Philip, who proved to be especially naughty. Thanks to Assistant Coach Beck for keeping everyone entertained, and the athletes running fast. Of course, the DASH fans were great as always. We have another big race next week. We will see what this team can do for an encore. The high school meet ran at the beautiful, and hard to find, Fox River Park near Silver Lake yesterday. The meet was hosted by the big Westosha Central school, and it was our last tuneup before the big Homeschool Championship meets the next two weekends. The boys ran short-handed, but overall the athletes liked the course and ran fast. We were able to line up six athletes for the girls race this week, but just barely. Makayla Gergeni ran to the start and made it with just two minutes to spare. When the gun went off, Andrea Beck assumed her usual role in the front of the pack like she has done all year for us. In the end, she captured the 13th place medal, and broke 17 minutes for the second time this year. Zipporah Caspers had her best race of the year and looked good as she raced around the course in 19:35 to lower her personal record. Hannah Schein, Stefanie Klaves, and Amelie Kemmann stayed together for close to two miles until Amelie sped ahead. Amelie finished very strong and lowered her best time of the year by over a minute. Hannah Schein did not get out quite as fast as usual, but was able to give us a very steady race, and excited the DASH fans as she moved ahead during the fast downhill finish. Stefanie Klaves made it to the meet and really helped the team, giving us a solid run to be our 5th runner in. Makayla Gergeni is still clearly not running as well as she can because of her hip injury, but she was able to finish this time. Let’s hope she heals up in the next nine days. For the boys, John Sherman led Matt Lange and Joe Hughes through the first two miles. In the last mile, all three boys ran together and gave us a thrilling finish. Joe Hughes came from behind to be our first runner in, with John less than a second behind. Matt Lange was the next runner in, giving us a nice trio at the top who all put up some nice times. Less than a minute later, Samuel Zinkgraf crossed the finish with one of his best races of the year. It is exciting to see the boys running this well. Isaac Fredricks was able to finish this time, but he also is not running as well as he can right now as he deals with some health issues. He has nine days to get ready for Madison. Thanks to all the parents who found the park. GPS devices have trouble pinpointing it, so I was very thankful when everyone arrived in time. Thanks to Lucretia Nyhart who saved the day and captured the meet in photos. Photo duties almost fell on me which would not have been good. I am off to Rochester in a few minutes. This was the fastest post I ever wrote, so I am improving my speed just as the athletes are. It is time now to cap off our great season with some good times at our Championship meets. This is what we have been waiting for all season. Let’s enjoy it while we can. The middle school team was back at Kettle Moraine Lutheran High School again on Wednesday. This was the much-awaited meet with the fun run at the end. 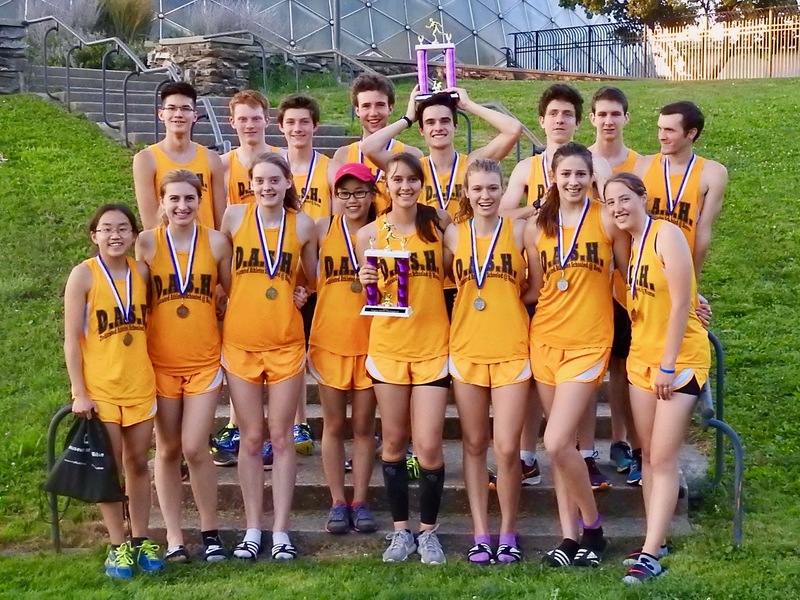 The girls ran a little short-handed, but the weather was perfect, and we posted some great individual results. Julianna Caspers was back on the course where she turned some heads with her fourth place finish last week. She proved it was no fluke as she ran five seconds faster this time. It was a tougher race this week, and Julianna ended up in 11th. Grace Caspers and Mary LeSac were back running together again. The end result was the same this time, with Grace edging Mary at the finish. These little girls all can run! Maddy Schneider did not have it this time. She struggled from the start, was hurting, and ended up as one of the last runners in. She will have a chance to make amends next week. Daniel Caspers was back running like he did at the end of track season. Daniel pushed Leif Kostrzewa along for over a mile, but Leif took control of their battle in the end. Leif and Daniel both had great races and that is exactly what the team needs from them right now. Joshua LeSac ran with Daniel and Leif for awhile, but all the raspberries he had eaten may have caught up with him. He pushed hard to the finish and still ended up with a respectable race. Noah LaBonte put together a complete race this time. He had a good start, pushed hard up the hill, and finished strong. Very nice! Seka Kostrzewa gave us his usual great effort, and pushed Noah along, but this time the big kid won. Elijah Anumolu just keeps improving. He is getting very fast now, and came very close to staying with Seka. All the boys had good days, so the coach was very happy with this race. The 7th and 8th grade girls were missing two of their stars. Fortunately, Faith was able to pick up the team by giving us her best race of the year. In a very tough field, Faith was able to move into 7th place down the hill and hold it the rest of the way. She beat her personal best by six seconds and is really rounding into top form now. Grace Dupar had a great first mile, but could hardly make it up the hill. Lucretia Nyhart went out slower, but started her charge at the hill. The contrasting races joined together in the last loop, and the two girls had a great race to the finish with Grace just barely holding off Lucretia. Gulla Kemmann ran well in spurts, but could not maintain it throughout. In the 7th and 8th grade boys race, John LaBonte paced Joshua Anumolu through the first mile and up the hill. Joshua was then able to pull away in the last loop to be our first runner in once again. John put up a very good time and really ran fast which bodes well for the big races coming up. John Klaves went out a little slower than he did his last race, but also put up a respectable time. These guys ran well and should lead our team the next two weekends. In the fun run, Ransom Nyhart was on a mission to win, just like he did a few years ago here in the 7th and 8th grade race. He got out fast and was never threatened, and won himself a t-shirt from this year’s early high school meet. The shirt has all the names of the participant schools, including DASH. Andrea Beck was the first girl to the finish line giving us yet another victory. Her souvenir shirt proved a little large. The coach wanted to have a good race, so he ran behind DASH star Julianna Caspers. He showed off his speed by outkicking her to the finish. It pays to race the kids when they are tired. Eileen Dupar was the first DASH mom to the finish. It was an easier than expected victory for Eileen as the other moms, intimidated by her speed, decided not to run. 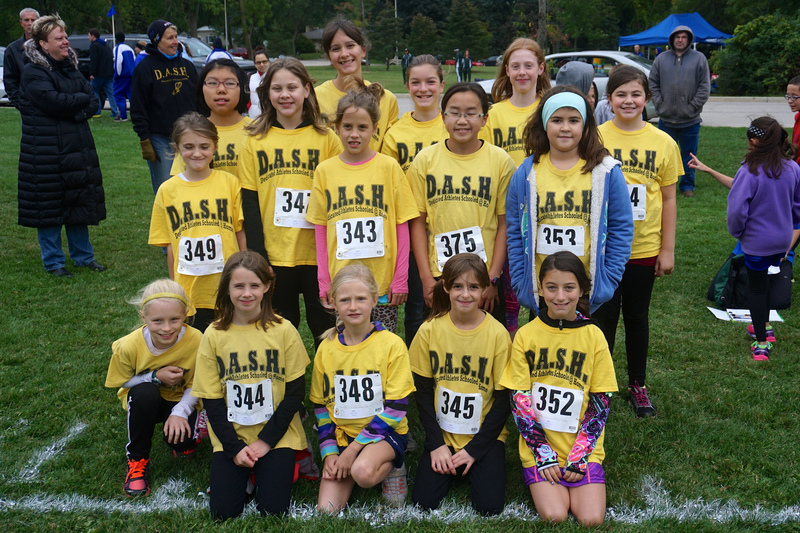 It was great to see so many middle school runners post good results in the fun run as well. It was indeed fun. Thanks to Ed and Mary Beck for marking times for the fun run. Thanks to Amelie Kemmann and Stefanie Klaves for collecting the place cards. Also, thanks to Stefanie for letting me beat her in the fun run. Thanks to the camera lady and Zipporah Caspers for taking the photos. Thanks to Birgit Kemmann for handling a naughty little bundle named Philip. Thanks to all those who ran in the fun run. All the yellow shirts in the race made our team look like it had the most fun. It is a busy week for us, so thanks to the parents who are getting the athletes to the meets ready to run. It is hard to believe we have reached the end of our regular season. Overall, our key runners are proving fast. Stay tuned for the upcoming championship races. The middle school cross country team ran at our practice field, Greenfield Park, today in a meet hosted by Wisconsin Lutheran College. Plenty of fog was seen upon our arrival, but the rain was held at bay. 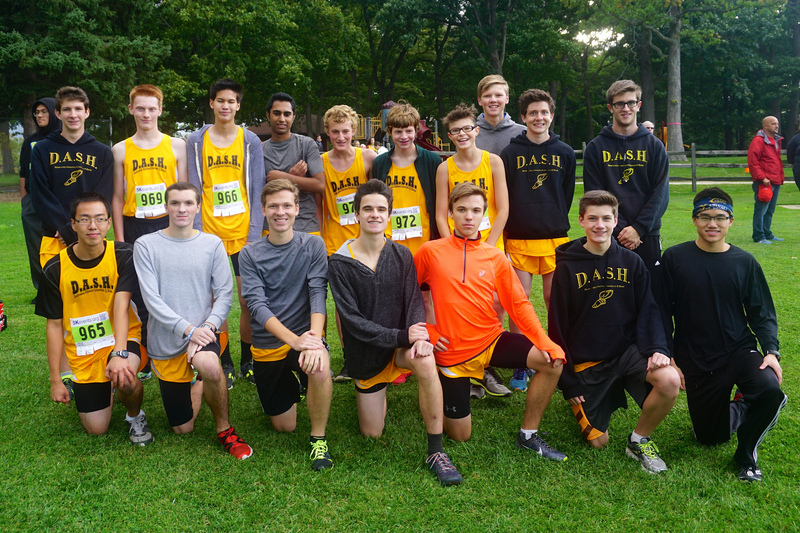 Twenty-two athletes ran with DASH yellow jerseys, the same jerseys that have had such great success in the past at this meet. This year we took home no medals, but we posted some great results from some key people which gives us a good feeling about our chances in the key meets that will be coming up fast in the next two weeks. Joshua Anumolu got off to a fantastic start and continues to be our number 1. He faded some in the woods, but was able to finish strong. John Klaves was at his best in this race. He went out faster than I thought he should, and proved me wrong by keeping his sizzling pace to the end. John is moving up and is one to watch. If he races like that again, I will get him a new shirt. John LaBonte struggled early, and never seemed to get back to speed. Hopefully it was the morning race, and will bounce back. Leif Kostrzewa was as impressive as John Klaves. Leif moved up into a good position early and pushed hard all the way to the finish. Leif ran smart and fast, a very good combination. Joshua LeSac was another one who ran well. He faded some in the middle of the race, but recovered to post a good result. Daniel Caspers got out slow again and is just not running as well as he can. He missed Mr. Beck’s practice, but he won’t this week. Seka Kostrzewa ran his best race yet. He is always seen running hard, and has become a fan favorite. Noah LaBonte had a good first loop, but then tired. He is showing signs of a breakout race soon. Ethan Scholz ran his first race and was seen smiling as much as anyone. He moved up to finish close behind Noah. He also was one of our best DASH fans. Elijah Anumolu has taken on the look of a runner now. His focus is there, his stride has really improved, and he is lowering his times. What more can you ask? Jacob LaBonte struggled throughout, but did look good at the finish. He is only a 3rd grader and is learning this year. Overall, the boys results were very up and down. It was our first morning run of the year which is always tricky. Wednesday’s race will show us a lot more about how the team is coming along. The scoring of the meet was very confused this year with many teams having their older athletes ending up in the 6th grade results. We will not dwell on those, but stay focused on the races ahead that will put a stamp on our season. Our health is always the biggest concern this time of year, along with getting just the right amount of running in. This team has been good, soon we will see just how good. Thanks to Mr. Beck, whose Thursday middle school practice clearly helped us post some of our best results of the day. Thanks to the picture lady who got some good photos in difficult conditions. Thanks to the iPhoto program for making the photos much more clear. 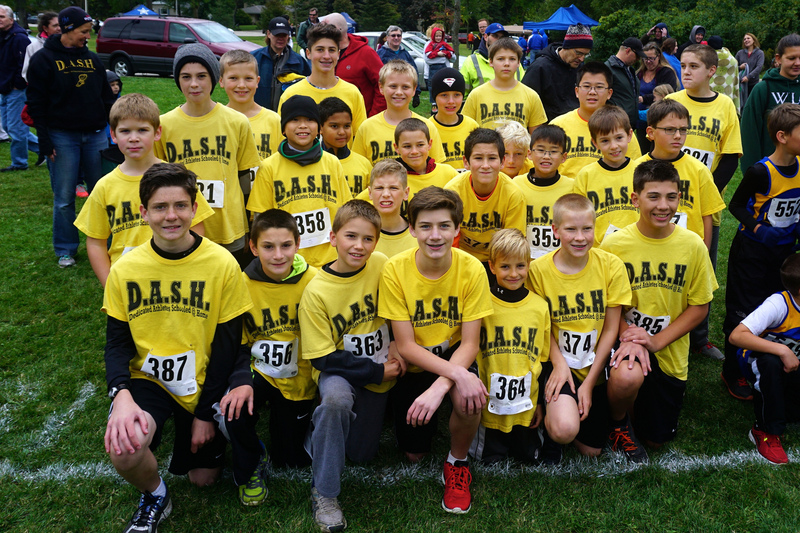 Thanks to all the DASH fans who lined the course and helped push everyone along. It takes a close-knit team working together to post good results, and the DASH team always proves to be up to the task. 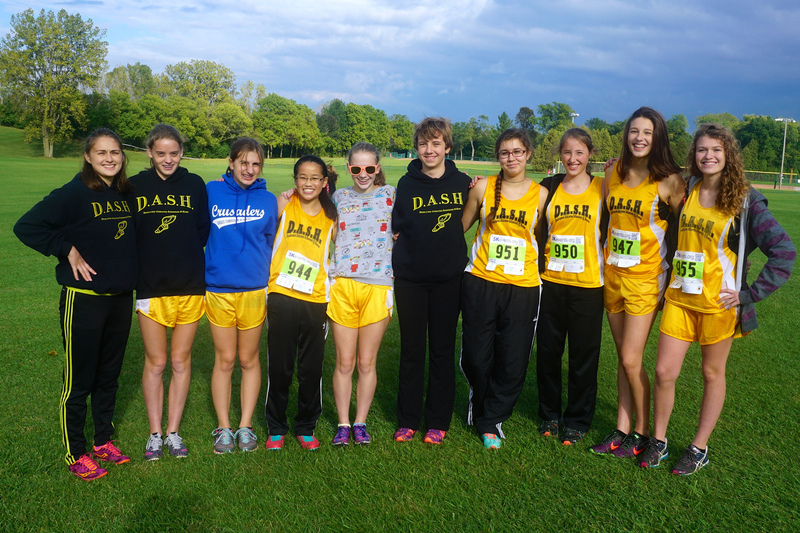 The DASH high school team ran in its much-awaited meet at Armstrong Park yesterday. Nine teams participated, including Eastbrook Academy and host The Prairie School. 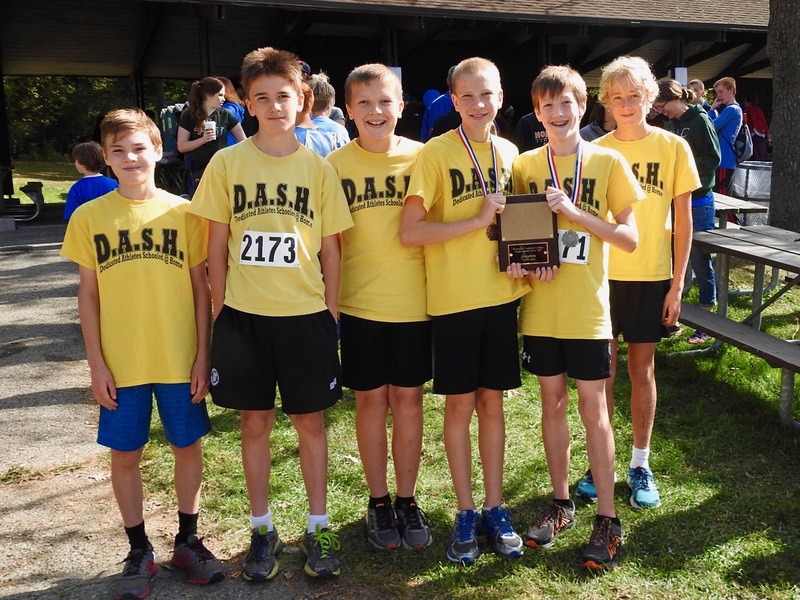 We have posted great individual times and team scores in the past on this course, and this year we had the added challenge of running against two former DASH stars from the Eastbrook team, (who in the opinion of most look much better in DASH yellow). The day was warmer and more humid than usual which made the finishing times a little slower than past years, but the racing was as good as it gets. Andrea Beck ran with a bad back on this course last year, and was ready to make amends and run with the leaders this time. After 17:02 had passed, Andrea crossed the finish line with only two senior girls ahead of her. I am already waiting for next year’s race. Zipporah Caspers put together a well constructed race, and passed two girls near the end who were giving her some problems earlier, to finish 18th. Hannah Schein continued her trend of improving each time out. She is edging ever so closer to breaking 20 minutes now, which gives me a good excuse to keep her practicing hard. Amelie Kemmann had one of her best races of the year to be our fourth runner in. She was looking much healthier this time out. Unfortunately, the girls team did have one casualty. Makayla Gergeni was only able to go about a half mile before she stopped with a hip injury. Hopefully her stopping early will mean we will not have to wait as long for her return. She has lowered her time with each race this year, and has become a big part of the team’s success. There was a certain intensity in the air before the start of the boys race that was finally released when the gun went off. 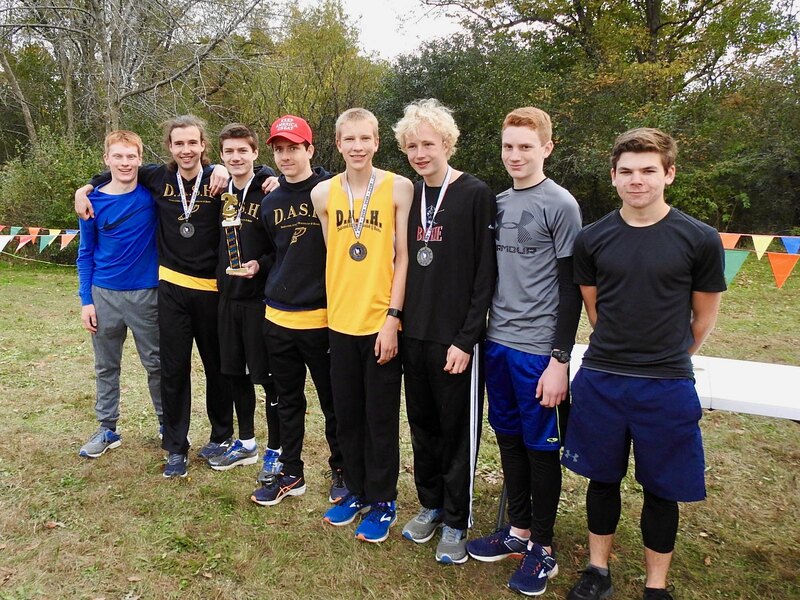 It did not take long for a lead pack to take shape which included a boy each from Brookfield Academy and Martin Luther, two well-known athletes from Eastbrook, and our own stars, Ransom Nyhart and Jacob Dickman. At the half-way point things had spread out just a little, with Ransom running in third on the heels of an Eastbrook freshman. Jacob was about 10 seconds back biding his time to move up. In the last mile, a Martin Luther athlete moved to the front and Ransom had fallen back to fourth. Then just before the finish, the Luther boy missed a turn and let three athletes pass including Ransom. Ransom was able to out sprint a Brookfield Academy athlete down the hill and capture 2nd place for the DASH team, just behind an Eastbrook freshman with a familiar face. Jacob Dickman gave us his usual strong finish to give us a second top-5 finish, a feat no other team could manage. As good as the racing was in the front, following the rest of our DASH stars was no less exciting. John Sherman was our third runner early, but Matt Lange moved up to join him a little past the half way point. Matt and John pushed each other for the next mile when Matt picked up the pace even more and crossed the finish line a tick under 20 minutes. It was his personal best by 51 seconds. Matt has gotten very good very fast, and has become one of the great stories of the season. John Sherman came in just seven seconds behind Matt with his best race to date, and Joe Hughes ran faster than he ever has finishing with a time of 20:29. John and Joe’s times were DASH records for our four and five runners proving once again how good this team has become. Samuel Zinkgraf added to the list of great running on the day, setting his own personal record. He looked strong throughout and really showed off his finishing speed at the end. Zebulon Caspers wilted in the second half of the race and was far from his pace of last Saturday. Hopefully he will be better in Rochester. Brady Klaves broke 30 minutes for the second consecutive time. He has a couple more tries to try to push his time even lower. Our one casualty for the boys was Isaac Fredricks. He was unable to finish because he ate something he shouldn’t have for lunch. We will be running short next week, so hopefully he will be back ready to run. The boys finished 4th overall, just two points out of 3rd, and seven points ahead of 5th in a very tight race among the top 5 teams. The DASH fans had some heavy competition in the cheering department at the awards ceremony, but sneaked in a victory in that department as usual. 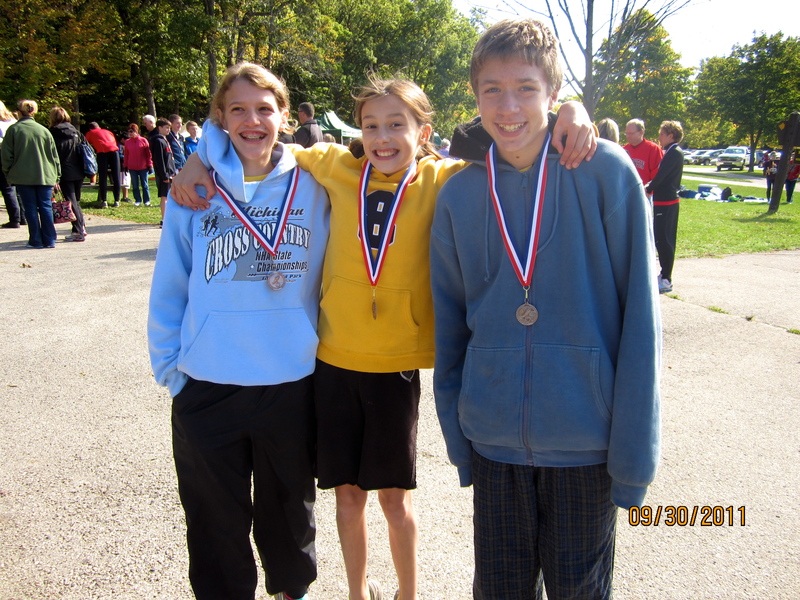 Great DASH cheering went out to medal winners Andrea Beck, Jacob Dickman, and Ransom Nyhart. The day continued at DeRango’s Pizza where we met up with the some former DASH and now Eastbrook stars. The DASH team made them feel at home, and consoled them with pizza and some scintillating DASH conversation. I even got my iPad out and turned to our Flickr site so they could reminisce over some great photos from back when they proudly donned the DASH yellow. (Their team doesn’t have anything like that.) We did all we could to keep their minds on happier days. 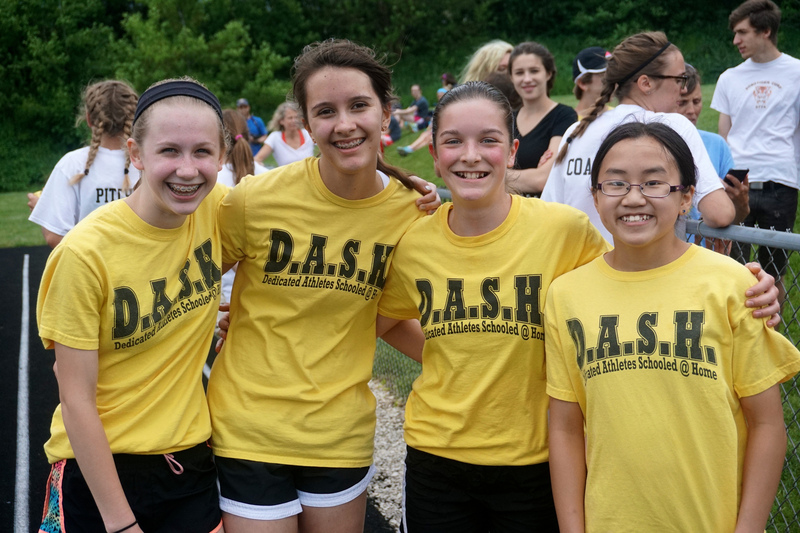 It was another great day of DASH racing, and once again the DASH team proved special. Thanks go out to the DASH fans who were all over the course. Thanks to the athletes for keeping us inspired with their effort and keeping us running around to see them. Thanks to the camera lady for capturing the action. The photos of the race have already been seen by many. Be sure to check them out if you haven’t already. As I mentioned, not every team has stuff like that. One more race, plus the championship races, are left for this team. Let’s keep pushing toward some more great results. Then we can rest and enjoy some ice cream. 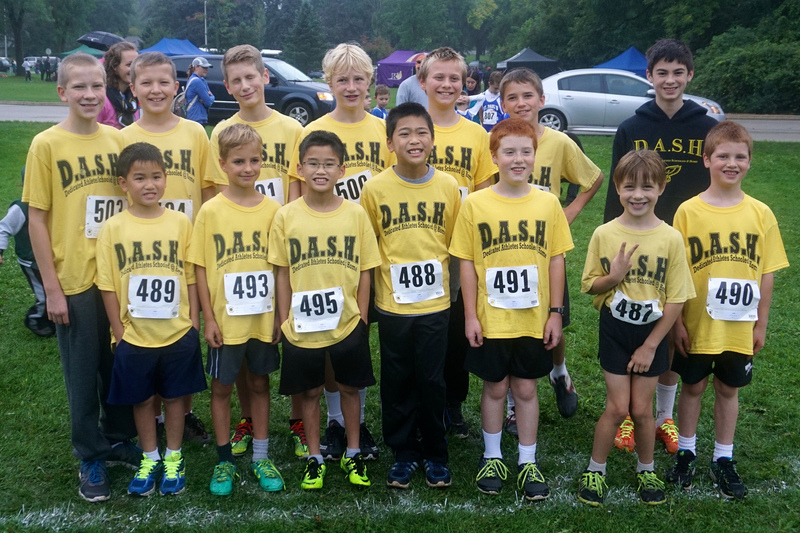 The DASH middle school cross country team was found competing at Kettle Moraine Lutheran High School on Monday. The meet was hosted by WCHSA, and is the first of two meets scheduled for this 2500 meter course. Twenty other teams were there, including four big public school teams. The weather was perfect to run to some good results, and the team proved ready. This is the day we have been waiting for, the debut of a few more of our fast first grade girls. Grace Caspers and Mary LeSac came ready to run in their first cross country race. Angela Walters was given a DASH jersey at the meet when she also decided to run. The girls joined Maddy Schneider and DASH veteran and fellow first grader Julianna Caspers to give us a very young and very exciting 6th and under girls team. Julianna Caspers went out fast with the plan of keeping the leaders in her sight the whole way. She went down the hill in about 7th place and was going stride for stride with the top girls in the race. When she came back up the hill, Julianna had moved up to 4th place and was still looking strong. She headed for the finish line with a pack of 7 girls just a few steps behind. Could a first grader hold off such a pack? Oh, yeah! Julianna showed off her finishing speed and was never threatened. The 4th place medal was hers. 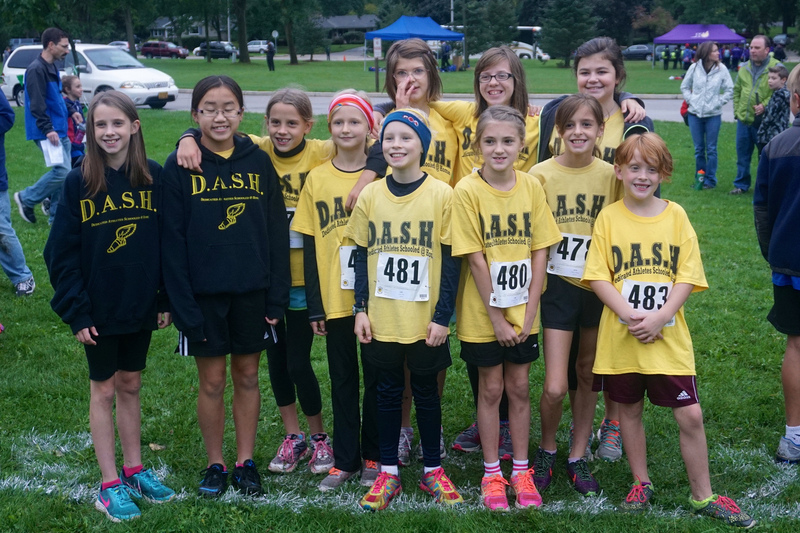 The other DASH girls were also running well. Angela Walters had an amazing first race as she ran hard the whole way and finished in 61st place. I know Angela can run, but she did much better than anyone expected. She is a star in the making. Maddy Schneider had one of her best races and is really starting to compete now. Maddy was pushed along by Grace Caspers and Mary LeSac who ran together the whole way. They got tired, but just kept pushing to the finish, staying ahead of about thirty athletes. It will not be the last we see of these two future stars. 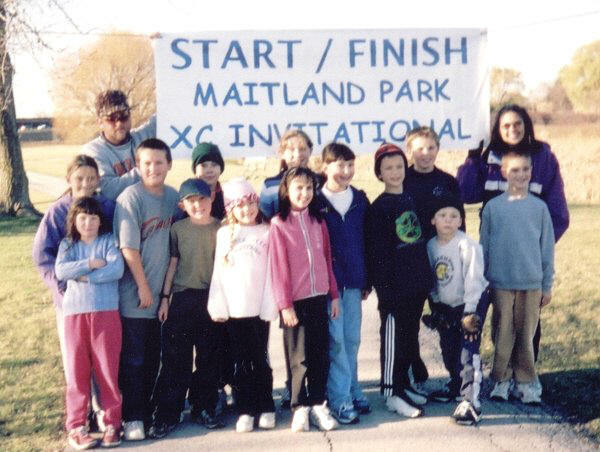 We ran a very young 6th and under boys team as well. Third grader Leif Kostrzewa led the boys through the course, finishing in 29th place. Leif is young, but he has settled in as one of our best and most reliable runners. It took a while for Daniel Caspers to get going, but he moved up late to be our second runner in. I am still looking for him to have a breakout race soon. Joshua LeSac had a very nice run, and finished just two spots behind Daniel in 40th place as he continues to improve. Seka Kostrzewa never slowed down as usual and gave us another great result. He is only 5 years old, but I was counting on him to finish where he did. He is that good, and really kept our team score down with his effort. Noah LaBonte had his best run of the season. It is very encouraging to see him improving the way he has. A runner that people are starting to talk about is Elijah Anumolu. He is really looking good now, and the distance of a cross country race is becoming routine for him. Jacob LaBonte is running good in spurts. It won’t be long until he puts a great race together. We fielded a very strong team in the 7th and 8th grade girls race and they did not disappoint. Faith Caspers stayed in medal contention throughout. The competition was very good this year, but Faith battled to the end and put her claim on the 10th place medal. Sammie Ronge kept Faith in her sights the whole way, and really ran well at the end to give us a second top-15 result. DASH veteran Kayla Walters always gives us a good result. Her effort was good for 31st. Grace Dupar backed up her medal winning race with another good one. All four of these girls are having great seasons. Gulla Kemmann had a good start, but slowed at the end. Running by the track maybe had her dreaming of her MVP track season. Our big guys, John LaBonte and Joshua Anumolu lined up in the largest race of the day, the 7th and 8th boys race. Joshua put together another great run. The progress he has made in one year is amazing. John LaBonte has improved his form and is also posting some great results. They both finished in the top 30 percent which bodes well for the championship races ahead where these two will lead our young team. The team results were called out and our 6th grade boys team had placed 6 out of 13 team that scored, and were 3rd among the non-public schools. Next year will be a big one for the boys. The 7th and 8th grade girls were 4th and were only beaten by the big public school teams. Our little girls team finished 8th and have plenty of years ahead to improve on that. We had a very good day, and I felt even better about it after looking over the results. We have a chance to be near the top in all the meets ahead, so we have to stay ready. Thanks to the parents who got the athletes up to Jackson ready to run. Thanks to the athletes for giving great effort and being great DASH fans when they were not racing. We have a lot of photos of the athletes cheering each other on. Thanks go out to Zipporah Caspers who was the team photographer. Thanks to Ed Beck, Mary Beck, and Kam Caspers for doing the scorekeeping, getting the cards, and helping everything go according to plan. We are in October now and where we want to be. We need to maintain our health and conditioning to be at our best in the races ahead. It is turning out to be another good year for the middle school team. We will soon find out just how good.